LAS VEGAS— From the Better Late than Never department, Vizio has announced that its new 15.6-inch touchscreen notebook and 24-inch touchscreen all-in-one PCs will be powered by fourth-generation Intel Core processors (formerly codenamed Haswell). And from the If it Ain’t Broke, Don’t Fix It department, both machines will use the same enclosures as Vizio’s 2013 models. Virtually all the changes are under the hood. But Vizio didn’t pick just any Haswell chip: Both the laptop and desktop models feature Intel’s best mobile CPU: The Core i7-4750HQ, with Intel Iris Pro 5200 integrated graphics. Vizio is upgrading its laptop and desktop models with Intel’s best mobile CPU: The Core i7-4750HQ. Both models will feature 8GB of DDR3/1600 memory and an Intel 802.11ac Wi-Fi adapter to support video streaming via WiDi or Miracast. 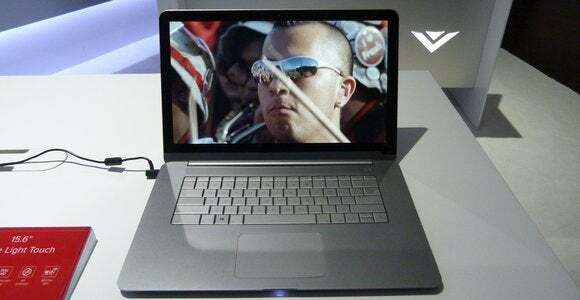 Vizio product manager Brad Johnston told me they added a steel plate beneath the keyboard on the 15.6-inch Thin + Light in order to deliver better tactile feedback, and that they upgraded the laptop’s battery to support the quad-core processor. Johnston said the laptop lasted about 7.5 hours in their lab tests. 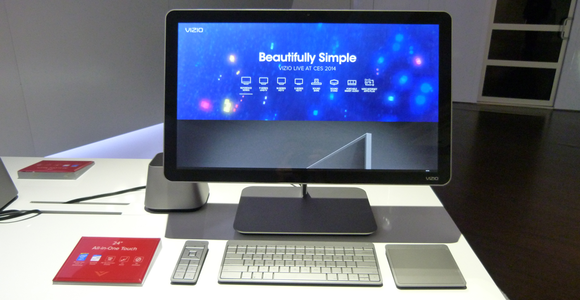 The 24-inch all-in-one will once again come bundled with a wireless keyboard and trackpad, but no mouse. It will also come bundled with a wired subwoofer. Vizio didn’t release many other details about the machine, so we don’t know how much storage will be included, when the computers will go on sale, or how much they’ll cost. They will be sold direct from Vizio’s e-commerce site and won’t be distributed through other retail channels for the time being, according to Johnston.